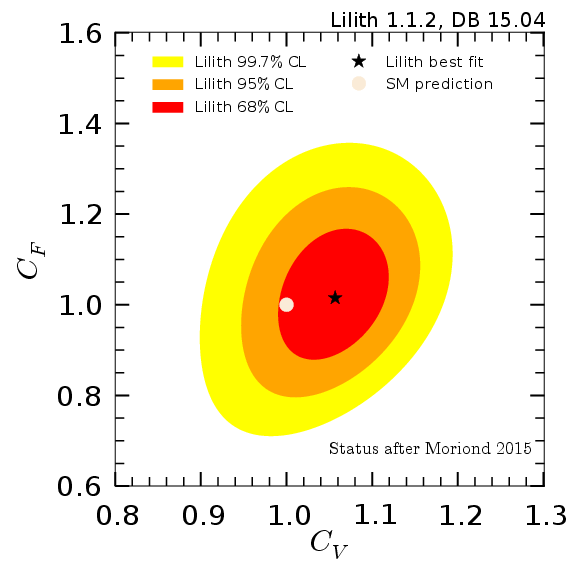 Lilith (Light Likelihood Fit for the Higgs) is a light and easy-to-use Python tool for constraining new physics from signal strength measurements of the 125 GeV Higgs boson. 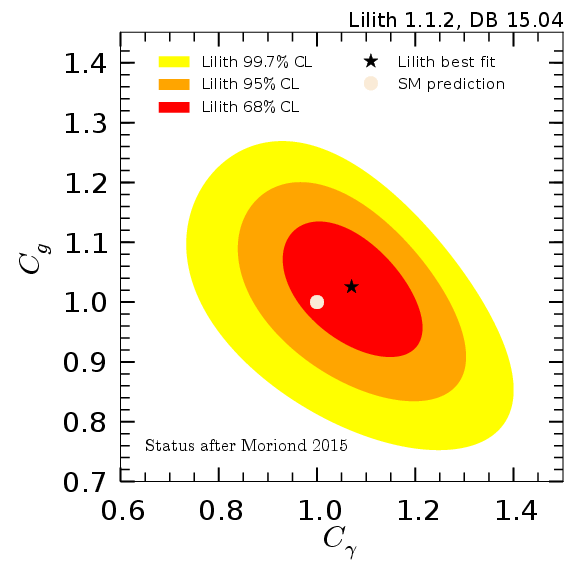 Lilith is provided with the latest experimental measurements from the ATLAS and CMS collaborations at the LHC and from the Tevatron. The Higgs likelihood is based on experimental results stored in an easily extensible XML database, and is evaluated from the user input, given in XML format in terms of reduced couplings or signal strengths. Latest database: 17.05, Include preliminary results from the Run II dataset. Information on the versions can be found in the changelog. If you use Lilith, please cite the manual (arXiv:1502.04138) as well as the version number of the database of experimental results. Questions or bugs can be reported on the Launchpad page, or sent by email to Jérémy (bernon[at]lpsc.in2p3.fr). Constraints in the planes (CV, CF) and (Cg, Cγ) using the experimental dataset as of April 2015 (DB-15.04). Lilith requires Python 2.6 or more recent (but not the 3.X series). It also requires the standard scientific libraries for Python: SciPy 0.9.0 or more recent, and NumPy 1.6.1 or more recent. Finally, the (optional) embedding of Lilith within a C, C++ or ROOT code requires the libraries and header files for Python development. More information on how to install these dependencies can be found in Section 4.1 and 4.4 of the manual of Lilith. Moreover, detailed information for the most common platforms can be found on the page prerequisites. The publication Status of the Higgs couplings after Run-1 of the LHC using Lilith 1.0, Phys.Rev. D90 (2014) 071301, was based on an early version, Lilith 1.0. Lilith 1.0 (September 2014) and Lilith 1.0.1 (November 2014) are not maintained anymore and differ significantly from the release version 1.1. Moreover, these versions are not compatible with any database of experimental results shipped on Launchpad. It is highly recommended to upgrade to the 1.1.X series.